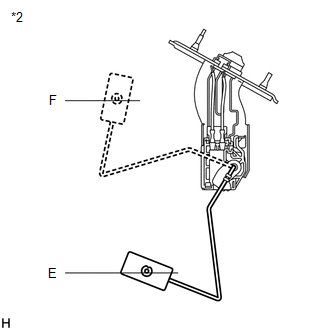 The meter CPU uses the fuel sender gauge assembly to determine the level of the fuel in the fuel tank. The resistance of the fuel sender gauge will vary between approximately 7.5 Ω with the float at the full position, and 185 Ω*1 or 225 Ω*2 with the float at the empty position. The meter outputs battery voltage through two 820 Ω resistors that are mounted in parallel inside the meter CPU. The meter CPU measures the voltage between the variable resistor in the fuel sender gauge and the two resistors mounted in parallel in the meter. Voltage measured at this point will vary as the float of the fuel sender gauge is moved. The highest voltage observed should be approximately half of the battery voltage. 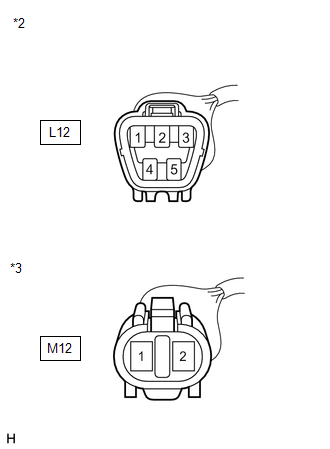 The fuel level warning light will come on when the fuel level is below 10.0 liters (10.6 Imp.qts, 8.8 US qts). (a) Check if a CAN communication DTC is output (See page ). CAN communication DTC is not output. CAN communication DTC is output. (d) Enter following menus: Body Electrical / Combination Meter / Active Test. Fuel receiver gauge indication is normal. (d) Enter following menus: Body Electrical / Combination Meter / Data List. (e) Check the values by referring to the table below. Fuel level signal displayed on the Techstream is almost the same as fuel receiver gauge indication. 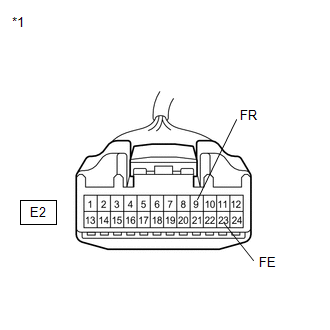 (a) Disconnect the E2 and L12 connectors. 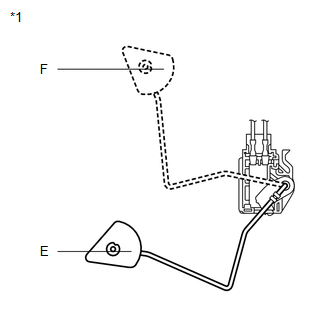 (b) Check that the float moves smoothly between F and E.
(c) Check if the fuel sender gauge arm is deformed. 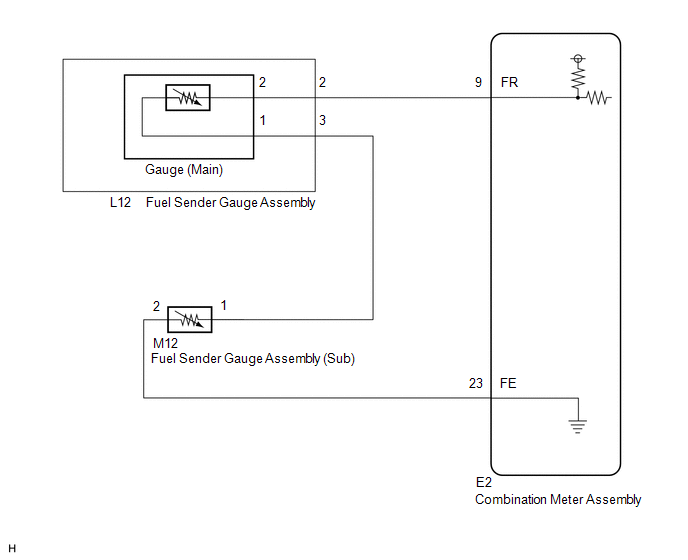 (a) Visually check for deformation on the fuel sender gauge assembly connector.